There is this Korean neighborhood in Makati where locals and tourists frequent to for some late night bbq. A few distance away from the busy Makati Ave./Kalayaan Ave. is the little Korea of Poblacion, Makati. It is a small neighborhood of Korean groceries, salons, spa and restaurants. We found ourselves in Jumong Korean Bbq Restaurant after D's high school friend suggested the place for a late night catch up dinner. Since the establishment is open 24 hours, it was still packed with diners even past 9pm. It was a simple dinner of our favorite Korean dishes. But before that, we enjoyed these unlimited servings of some Korean appetizers. 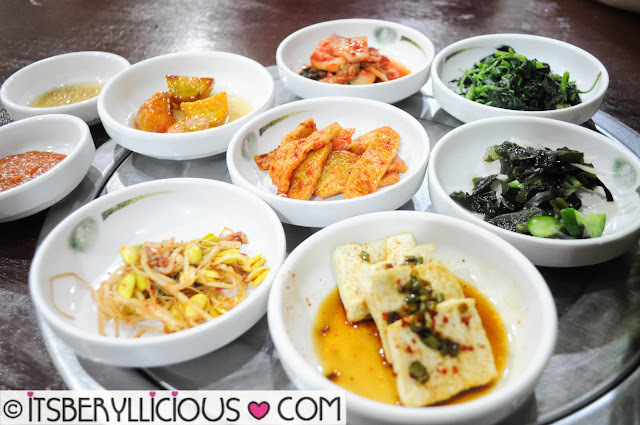 Jumong offers a variety of basic banchans- kimchi, fish cakes, beansprouts, spinach, sweet potato and tofu. Our friend highly recommended this Galbi Chim (P380). A hot stone bowl of beef shortribs stew best paired with a steaming cup of rice. A must-try at Jumong! For our grill, since we just had one order of meat, it was already cooked inside the kitchen. They require a minimum of 2 meat orders before diners can personally cook their orders on the table. We had an order of Chadol Bak Yi (P380) which is thinly sliced beef served with unlimited lettuce. We also ordered this huge Pajeon (P400) which is a pan-fried pancake filled with vegetables and seafood. Serving was really big and can be shared by 4-5 people. I was craving for some spicy Korean rice cakes, so I ordered this Tteokbokki from the menu. Unfortunately, I found Jumong's version lacking in flavor and dry. Don't forget to request for a cup of their sikhye- a traditional Korean rice beverage usually served as a dessert. 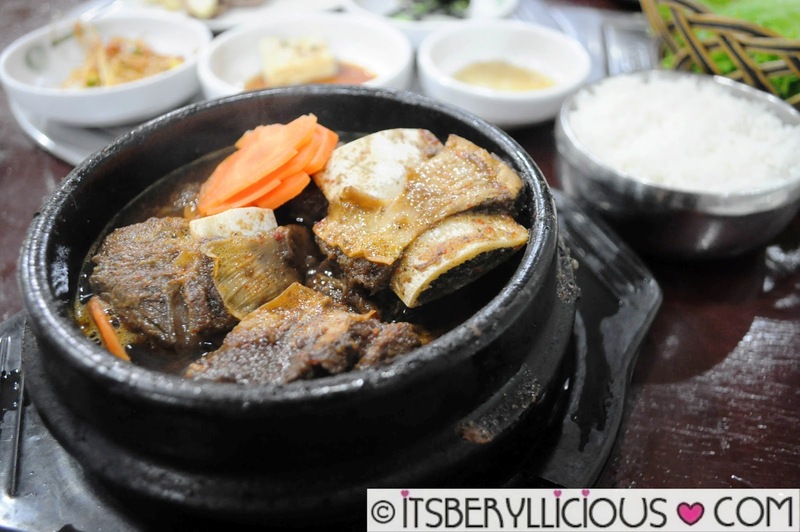 It is normally served after every meal at Jumong, but we had to ask for it during our visit. It was sweet and refreshing, the perfect dessert to end our meal. I would definitely go back to Jumong Korean Restaurant again. Their prices are very reasonable given the serving size of their dishes. 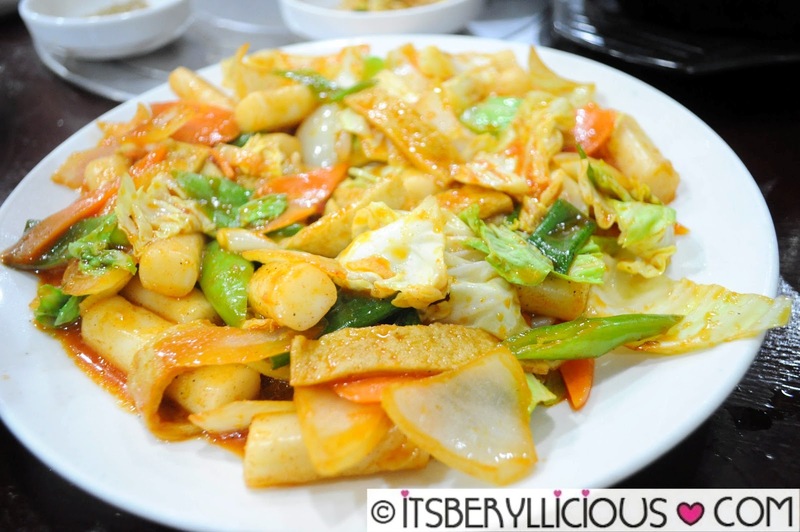 We enjoyed everything we ordered except for the tteokbokki, but overall, it was a great experience.